Double LP version. Includes CD. Gatefold sleeve with printed inner sleeves. Because Music presents a 20th anniversary remaster and reissue of The Three EPs, a compilation of The Beta Band's early music, dating from 1997-1998. Arguably one of the most acclaimed and loved bands of the past 20 years, by both fans and their musical peers alike, The Beta Band formed in St. Andrews, Scotland, in 1996. Their unique musical and aesthetic approach to everything they did set them far apart from their musical contemporaries. Together for a relatively short period of time, the three albums and three EPs that they released between 1996 and 2004 would nonetheless help define them as one of the most exciting and cherished bands of their generation. After acquiring the Beta Band's catalog in 2017, Because Music are reissuing a series of releases, starting with The Three EPs. Two-panel digipack with 32-page stapled booklet. Because Music presents a 20th anniversary remaster and reissue of The Three EPs, a compilation of The Beta Band's early music, dating from 1997-1998. Arguably one of the most acclaimed and loved bands of the past 20 years, by both fans and their musical peers alike, The Beta Band formed in St. Andrews, Scotland, in 1996. Their unique musical and aesthetic approach to everything they did set them far apart from their musical contemporaries. Together for a relatively short period of time, the three albums and three EPs that they released between 1996 and 2004 would nonetheless help define them as one of the most exciting and cherished bands of their generation. 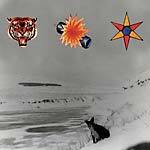 After acquiring the Beta Band's catalog in 2017, Because Music are reissuing a series of releases, starting with The Three EPs. Two-panel digipack with 32-page stapled booklet. Because Music presents a 20th anniversary remaster and reissue of The Three EPs, a compilation of The Beta Band's early music, dating from 1997-1998. Arguably one of the most acclaimed and loved bands of the past 20 years, by both fans and their musical peers alike, The Beta Band formed in St. Andrews, Scotland, in 1996. Their unique musical and aesthetic approach to everything they did set them far apart from their musical contemporaries. Together for a relatively short period of time, the three albums and three EPs that they released between 1996 and 2004 would nonetheless help define them as one of the most exciting and cherished bands of their generation. After acquiring the Beta Band's catalog in 2017, Because Music reissue the first in a series of releases, starting with The Three EPs. A deluxe vinyl edition gathering the EPs: Champion Versions (1997) on red vinyl, The Patty Patty Sound (1998) on two yellow vinyl, and Los Amigos Del Beta Bandidos (1998) on blue vinyl. Remastered tracks; Includes CD; Slipcase box set; Hand-numbered edition; Limited to 5,000.